If you’re tired of seeing the same old images and icons on your Kodi, you may want to jazz it up a little by installing a different skin. Here’s a guide on how to install Kodi skins, which skins are the best, and which skins to stay away from. 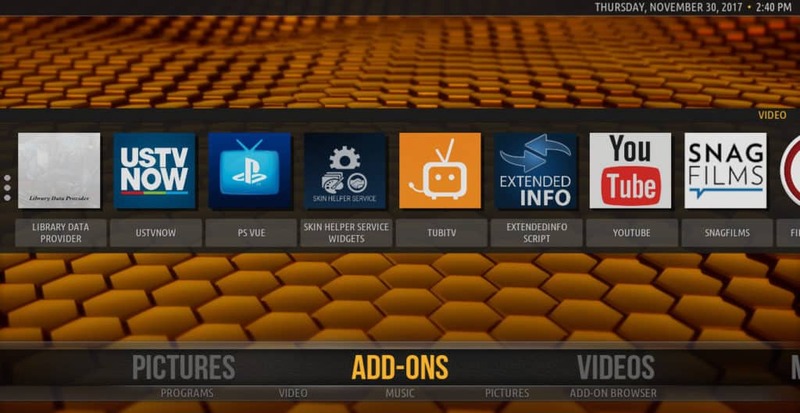 Thankfully, you can find most of these great Kodi skins right from the official repository. 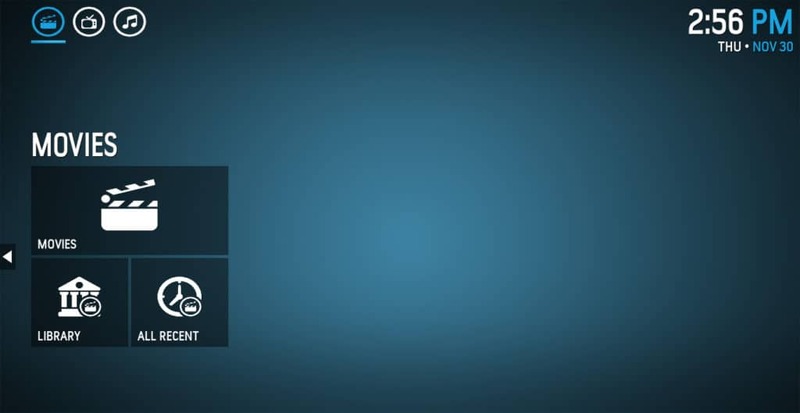 Kodi is an open-source video media player from the Kodi Foundation. By default, it can play files kept on your device’s hard-drive. 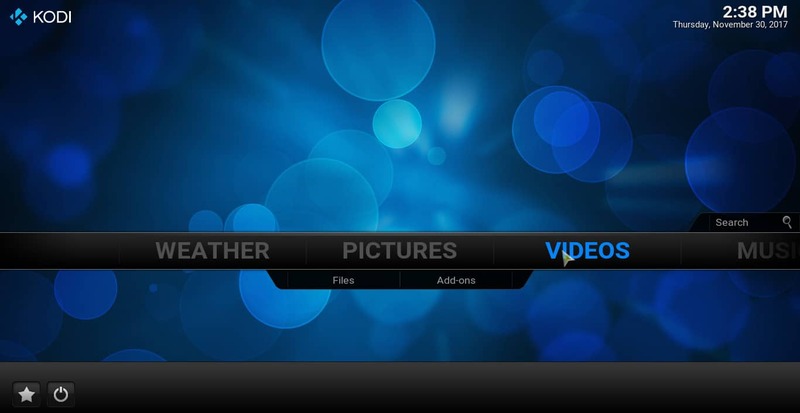 With Kodi addons, it can also stream videos from various services on the Web. 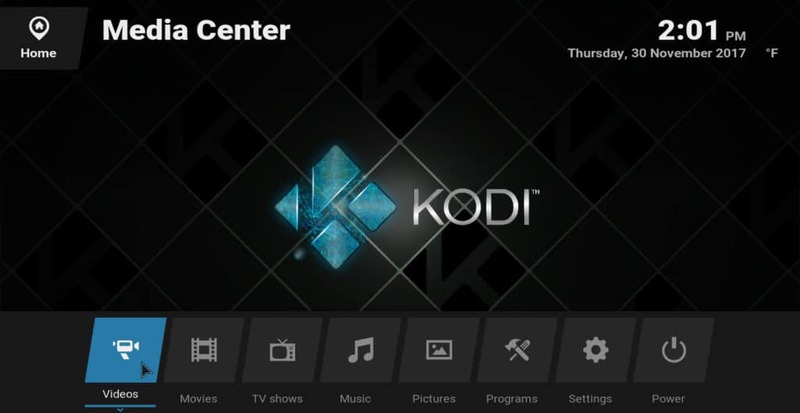 Kodi videos can be cast to a Roku using an Android or iOS phone. It can also be installed on PC, Mac, or Nvidia Shield. 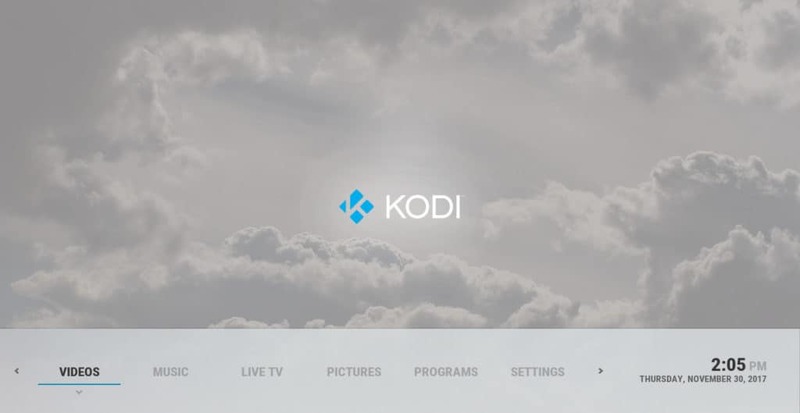 Kodi is often accused in the media of being used for piracy. While it is true that it can be used for this purpose, there are also a lot of legitimate streaming services that work with it. Meanwhile, all Kodi skins are safe to download and use although not all are safe to install. When people use Kodi to view unlicensed video streams, they usually employ a VPN to keep their activities a secret. However, all Kodi users can benefit from the privacy and security offered by a VPN, regardless of what content they are watching. VPNs protect users against Kodi buffering caused by ISP speed throttling. They can prevent MiTM attacks by hackers. They unlock content blocked by streaming services based on the user’s geography including Netflix. Overall, VPNs are an excellent tool to make video-streaming a safer and more enjoyable experience. Unfortunately, some VPNs are not as effective as others. Some invade the privacy of their users by keeping logs, have limited server capacity and slow speeds, or are a headache to install. 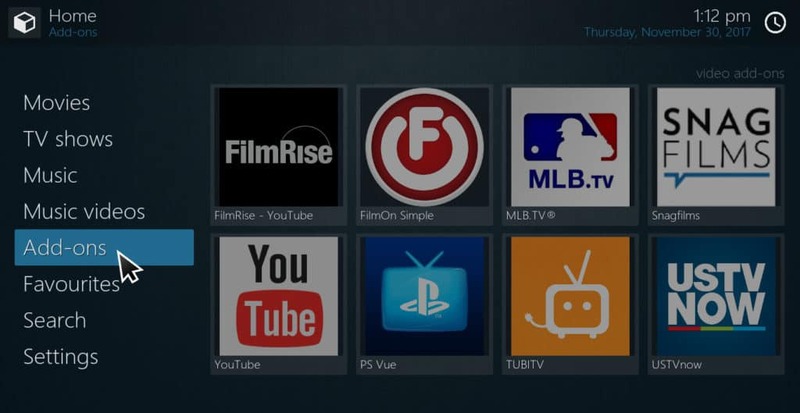 Because of these problems, we recommend IPVanish for all Kodi users. It has over 950 servers in locations throughout the world, has a native app for both Amazon Firestick and Nvidia Shield, and has a strict no-logs policy. That’s all there is to installing a new Kodi skin. To change back to the default “Estuary” skin, simply repeat the process. 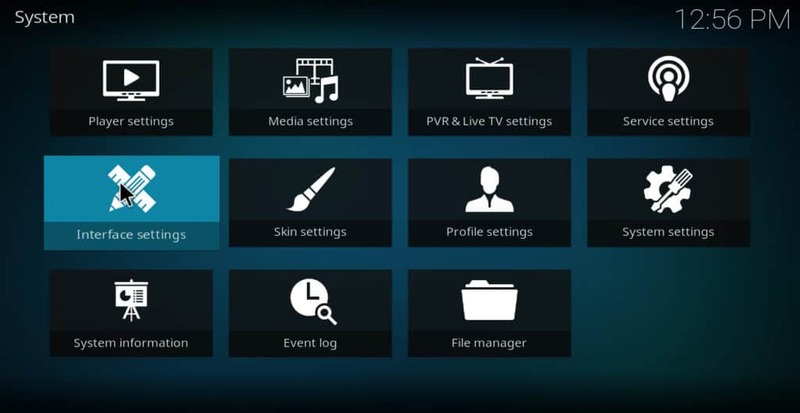 Most available Kodi skins come pre-installed with your Kodi app download. However, other skins may only be available after taking additional steps. We’ve explained below whether each skin is available directly from the official Kodi addon repository, or whether it needs to be downloaded and loaded up on Kodi separately. Which skins for Kodi are the best? The answer to this question is somewhat subjective. The skin that one person finds visually appealing may be considered ugly to someone else. However, there are still some principles we can rely on that everyone would agree with. For example, a skin should not crash Kodi, create a confusing menu, or forbid the user access to features that most Kodi users employ. With these principles in mind, here is a list of what I’ve found to be the 15 best Kodi skins. Below these, I’ve also listed some skins to stay away from. Phenomenal has an orange, grey, and black color-scheme, with some very eye-catching images. The menu items are laid out vertically, which makes it easy to adapt to for those accustomed to the default Kodi skin. In addition, Phenomenal creates a mini-menu in the lower-right side of the screen based on the position of the cursor on the left side. If the cursor moves to “videos,” for example, a list of video addons shows up on the lower-right. This list can then be accessed by tapping the right-arrow key or (on a PC) moving the mouse to the right. This allows you to quickly access the addon you need. Horizon has a pink and grey color-scheme with a vertical menu. 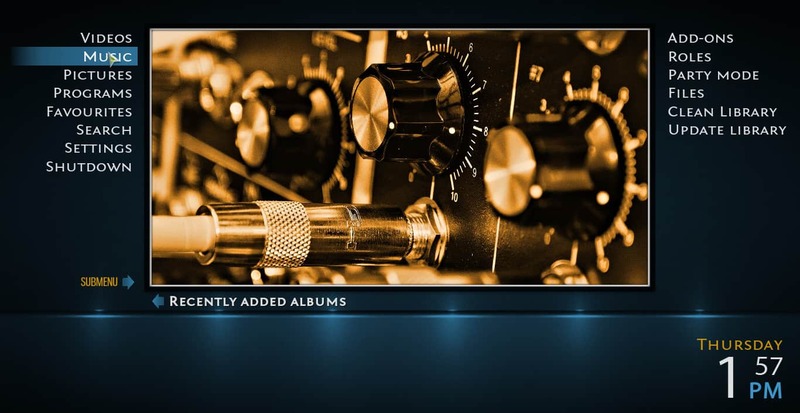 It uses icons on the main menu, such as a musical note to signify music and a hammer and screwdriver to signify addons. But hovering over the icons produces text telling you what the icon means, making it easy to determine what it does. Mimic’s color-scheme is blue and greyish-black, producing a cold, techno-oriented feel. It has a vertical menu, making it easy for Estuary users to navigate. It has no background images, rejecting flash in favor of simplicity. Ftv has a black background with grey menu items that turn yellow when hovered over. Its menu is vertical. The “addons” menu item has been replaced with an “app” item that shows only program addons. 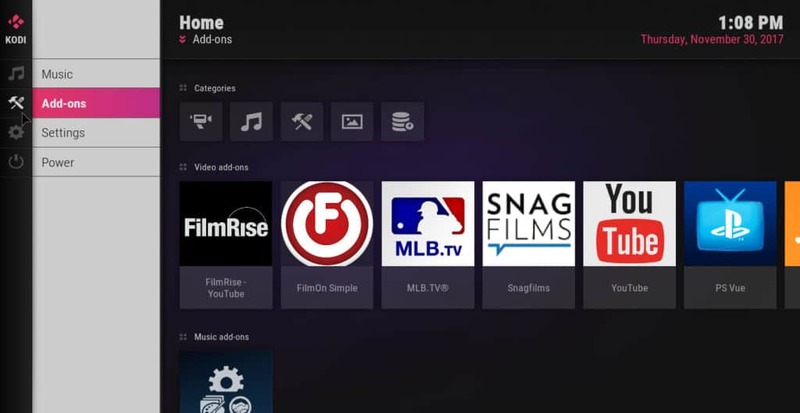 In order to find the video addons, you have to click on video first, then video addons. 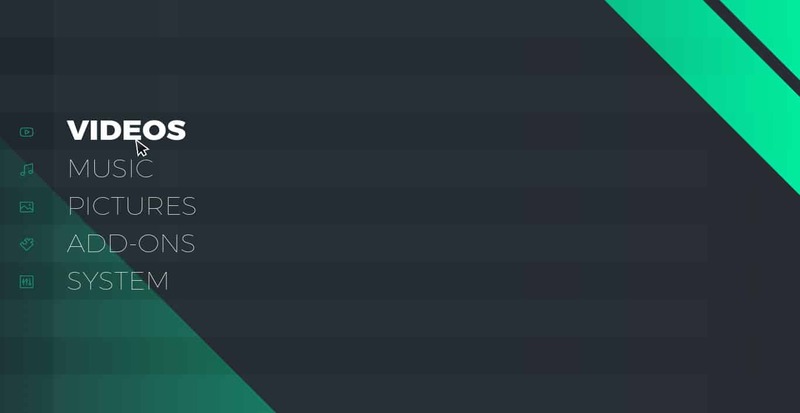 This is relatively easy to get used to though. The one big flaw to Ftv comes when you use it on a PC. When used on a PC, the cursor is a giant message that says “Warning: Mouse not supported please disable” even though the mouse works perfectly fine. If you’re using Kodi on a set-top streaming device that has no mouse though, this problem should not occur. Metropolis has a dark-blue color scheme similar to that of Mimic, but contains some images of mechanical things like cameras, gears, and old film cameras, thus keeping with the theme of a cold, robotic world. It has a vertical menu with submenus that appear on the right side of the screen. Unlike Phenomenal, the submenus in Metropolis cannot be accessed directly. You have to first click on the main menu item in order to get to them. 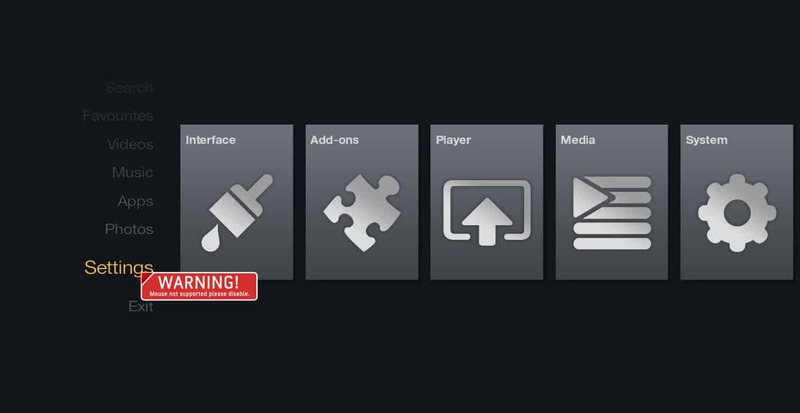 But at least these submenus give you a preview of what is in each menu, making it easier to navigate Kodi’s system. Metropolis also has colorful icons on the settings menu, including paintings of comic-book heroes, a gas station, TV set, and other objects. Eminence also has very detailed text in its menus items, making it simple to navigate. 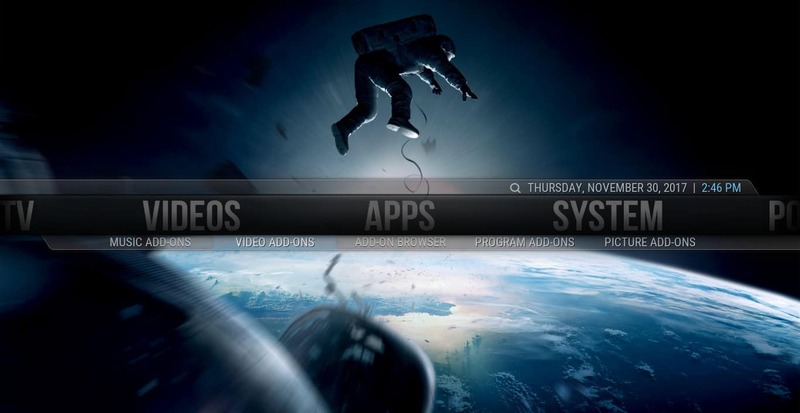 With a black & white color-scheme and no images, Bello 6 provides simplicity and ease of use to Kodi users. Its menu is horizontal and has no icons, just text clearly explaining where the items will take you. Like Ftv, using Bello 6 on a PC will create an annoying cursor warning you that a mouse will not work, even though it does. However, this cursor is a small red circle with a slash through it and a mouse within it, so it’s still not as distracting as the one that Ftv uses. When used on a set-top streaming device, this problem should not occur. Arctic Zephyr has a white and grey color scheme with a simple image of a cloud on the main menu, providing a very bright, inviting feeling. It has a horizontal menu consisting of only words, making for effortless navigation. Like Ftv, Arctic Zephyr will produce an annoying warning as a cursor when used with a mouse. In contrast to most of the other skins listed here, Grid has a silly, “cartoonish” feel thanks to the font used. The main menu has large, easy-to-read text. The addon menu is broken down into submenus for each type of addon (video, music, etc. ), and each submenu within it lists how many addons you have in that category. This can be useful when you are trying to find the right addon quickly. 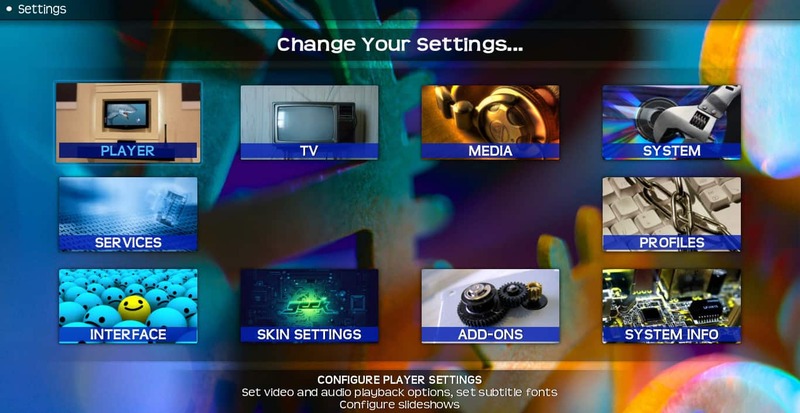 If you’ve been using Kodi for a while, you may prefer the default skin for Kodi Jarvis, the previous version of Kodi. Confluence is this skin. It has a horizontal menu with huge text, which means that you will have to scroll from left to right in order to see all of the items. But it definitely looks stunning, so maybe the extra work is worth it. Confluence has a blue and black color scheme with blue circles as the background image. Amber has yellow and black icons with yellow-hued images of film reels, a dolphin, an action hero, and other objects in the background. Like Confluence, Amber has large text in a horizontal menu. Aeon Nox is one of the more popular Kodi skins. There are also multiple variations of this skin available, including Aeon NoQ, Aeon Nox 5: Destiny, Aeon Nox 5: Dragon, Aeon Nox LEGO, and the popular Aeon Nox Silvo. The layout of Aeon Nox is similar to that of Confluence and Amber, with a horizontal menu and large text. The background image is of an astronaut who has lost his tether to his spaceship and is flying off into space, creating a feeling of excitement. It has blue and black for its primary colors. 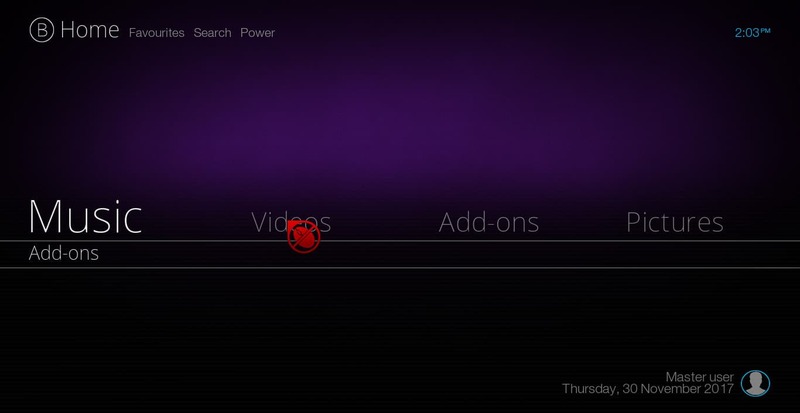 Like Ftv, Aeon Nox has an “app” menu item instead of an “addon” one, so you have to find your video addons by clicking video followed by video addons. Most versions of Aeon Nox are available through the official Kodi addon repository. However, if you want to get your hands on the Silvo versions of Aeon Nox, you’ll need to download his Aeon Nox repositories. We recommend using the Git Browser from TVAddons, then search for „mikesilva164“. From there, download and install the Aeon Nox repositories. 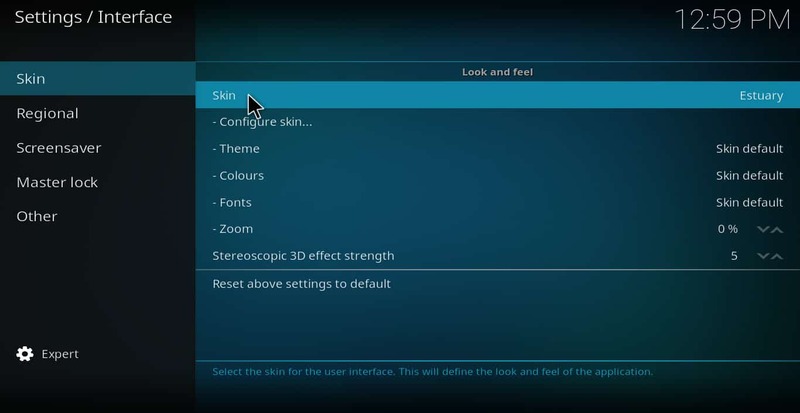 Afterward, his skins will be available from the Interface > Skins menu. 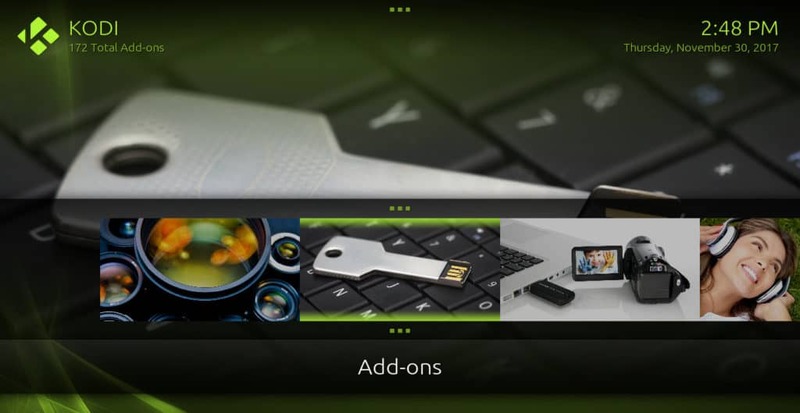 Chroma has a lime-green and black color scheme with flashy images. It has a horizontal menu with large text. 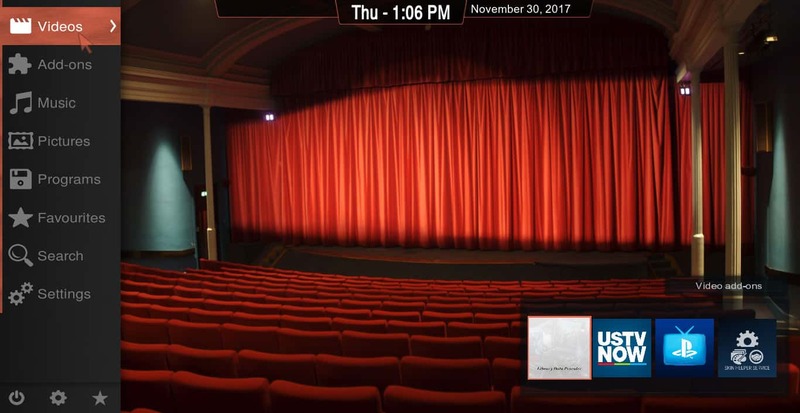 The background image changes as the cursor moves. Transparency has a vertical menu with stunning, artistic images that change depending on what item the cursor is moving over. Its primary colors are black and blue. The settings menu is especially easy to navigate, having a different image for each menu item and large text telling you what the item does. Unfortunately, the “addon” menu does not contain all of the addons, but is more like the “apps” menu on Ftv and Aeon Nox. 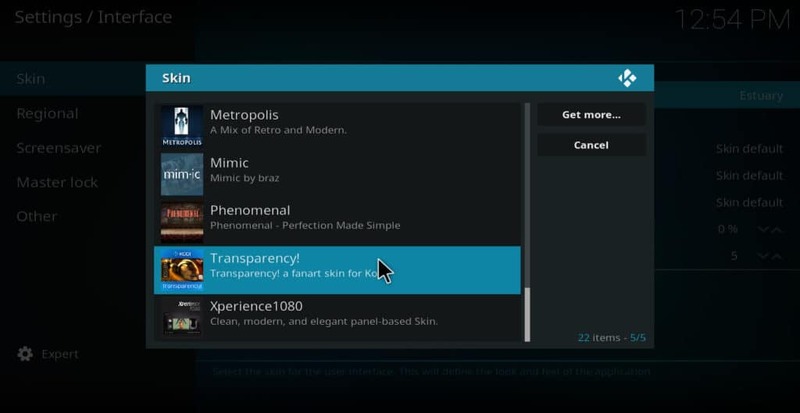 Like these other skins, Transparency allows you to find your video addons through a submenu. Adonic has a blank, black background. It has icons representing the various menu items at the bottom of the screen. Many of these icons open submenus full of repetitive new icons. For example, when you first install the skin and Kodi prompts you whether to keep the change, there are check marks and Xs stretching across the screen horizontally instead of just one check mark and one X. Likewise, when you open the video menu there are multiple options but only two icons: a file folder and a movie reel. This is confusing because it implies that there are only two options when actually there are several. Overall, this is a very confusing skin. I would not recommend it unless you really want a challenge. Box has a nice, simple, blue background with icons but no images. Unfortunately, though, it has no addons menu at all. In fact, there doesn’t seem to be any way to use Box except to play files on one’s own device. Since most Kodi users play at least some files from the Internet, this makes it useless to most people. I would not recommend Box unless you play from your own device exclusively. In my testing, this skin caused Kodi to crash. I would not recommend it unless you are willing to take the risk of having to reboot Kodi after it freezes up. Like Xperian 180, this skin caused Kodi to crash in my testing. I would not recommend it unless you are willing to take this risk. One thing to keep in mind is that skins can be hacked just like addons can be. For this reason, it’s best to stay away from skins not found in the official collection unless you know and trust the developer. Most of the skins listed in this article are from the official Kodi skin collection. 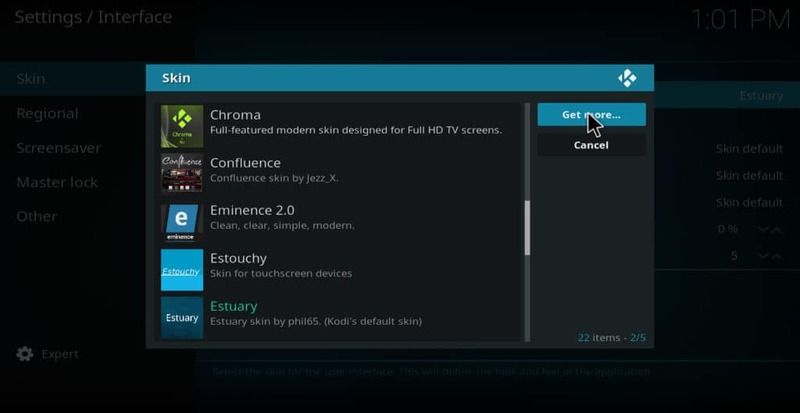 If you’re tired of the same, old Estuary Kodi skin, follow the instructions in this guide to install the best Kodi skins and avoid the worst ones.